As near as can be certain, on exit day – 29 March 2019 – UK exports of food to EU member states are going to stop. This is not a matter for negotiation and nor can it be avoided. It is an inevitable consequence of the UK leaving the Single Market and becoming a "third country". What happens to food imports from the EU is not so certain. This depends on whether conditions are imposed by the UK government which must be satisfied before consignments are allowed entry to our territory. And the intentions of the government in this respect are as yet unclear. As regards food exports, in an earlier piece, I estimated that an average of about 700 trucks a day pass through the two Dover ports (tunnel and seaport). That is likely to be highly variable though, with a possibility of seasonal peaks up 2,000 a day. Although this is only a proportion of the average of 12,000 or so lorries passing through, there are enough to cause considerable disruption in their own right. Nevertheless the likelihood is that the rest of the traffic may be disrupted as well, but for different if not entirely unrelated reasons. There are some measures, even now, that could be taken to reduce the general disruption, although these will only shorten the delays rather than eliminate them. And one possible outcome is the mother of all traffic jams, leading to Operation Stack on steroids. However bad it gets on exit day, we will be able to do nothing about the logjam at the French end, or on the borders with other member states (not forgetting the airports which take a substantial amount of freight). The decisions will have already been taken. But we can make preparations to mitigate the effects – which indeed we must. Bearing in mind that close-on 40 percent of our food currently comes from the Continent, if that supply chain is disrupted,we could have serious shortages, particularly in fresh foods. We would be confronting the very real possibility of empty supermarket shelves and people going hungry. What the government must do, therefore, is prioritise. That means protecting the supply chain to make sure that food imports get through. In the longer term, we will need to sort out the export situation, but first things first – people must be fed. Early on, some months before exit day, food exporters – whether selling processed goods or primary produce – will need advance warning. They should be told that, from exit day until further notice, no exports to EU member states will be possible. They must be instructed to keep their vehicles away from the ports. To enforce this, on the day, there will need to be road blocks in place well outside the ports. All commercial vehicles carrying food, live animals, or products of animal origin, must be kept away from the ports and the routes into them. Other vehicles should only be allowed into the ports on a one out (of Calais) - one in (to Dover) basis, with priority empty vehicles making their return journeys to the Continent. Thus, for each vehicle that clears a French ports, one vehicle is allowed into a British ports for processing and onwards clearance. This means that the traffic flow is matched to the processing to the speed of the French, thus preventing the ports and ferries (and the trains) from becoming congested. That there will be a huge drop in the export traffic is a given – but that is going to happen anyway. The more important thing is to clear the way for imports of food, keeping the supermarket shelves full and people fed. All being well, the first few days after exit day, there may be some relaxations. More goods may progressively be allowed through the system. But until and unless the French and other Continental ports have the facilities in place to check British imports – both in terms of veterinary and other specialist checks, as well as customs checks - the flow of traffic will be drastically restricted. Despite all that, reality is a long, long way away. Purely in terms of infrastructure, building and equipping the inspection posts and customs facilities – the actual physical structures – there is not enough time to get the buildings erected. Then staff also have to be recruited and trained – and paid for. Yet, for all the talking, we're getting absolutely nothing from the French state – or any other European states – of any plans to accommodate the extra checks. And the thing is, until the UK has concluded its Article 50 settlement, there is no way plans could sensibly be made. Thus we dwell in a state of complete unreality. On the front pages yesterday of the Independent and the Guardian, we got Prof Tim Lang publishing a report supposedly on Brexit and its implications for the UK food system. Yet it addresses none of the issues raised here. It really is as if really lives on a different galaxy. Unnoticed by the likes of Lang, what we are going to see in Brexit is the supply system being smashed. That will be the immediate effect. We need to stop messing about. We need to stop deluding ourselves. The only questions are how bad, and how lasting the damage will be. A secondary effect of Brexit on the food supply system will be to crash some domestic wholesale prices, as produce originally intended for export is diverted onto the domestic market. The longer-term effect, though, could be disastrous, driving farms into bankruptcy, giving rise to substantial price increases. And that's without considering tariffs – but then that's a whole different question. In a chaotic system, prediction is near impossible. Meanwhile, we have that arrogant fool, Dominic Cummings sounding off on Twitter, describing David Davis as "manufactured exactly to specification as the perfect stooge for Heywood: thick as mince, lazy as a toad, & vain as Narcissus". This stupid, stupid man is the one who ignored advice on adopting an exit plan, setting up a crass, negative Brexit campaign which is largely responsible for the mess we're in. 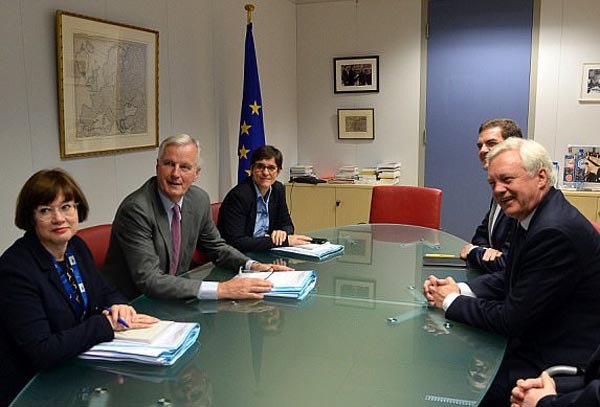 Cummings may even be right about Davis – a man sitting in Brussels with no notes - but he is hardly in a position to be critical of any of the players, given his own dire role in the proceedings. With the Tory "ultras" rampant, and our all but invisible and terminally weakened prime minister unable to control her own ministers, there seems to be no one in charge. Instead, we get fatuous reports from the likes of Tim Lang who, in all the many years I've known him has never let an original thought sully his mind. But, while the minions squabble, and the pretenders prance, reality is closing in, unrecognised and unchecked. It cannot be stopped. On exit day, the trucks stop rolling. The die was cast the moment Theresa May decided to abandon the Single Market.